NEW DELHI (AP) — The tiny bone fragments formally turned over to the U.S. Wednesday carry a world of significance and perhaps closure for possibly a few American families who lost a loved one over the mountains of India in World War II. During a solemn ceremony Wednesday, U.S. military members paid final respects to what they believe may be the remains of crew members from a B-24 bomber and a military transport plane that crashed on supply runs from India to China over the Himalayan Mountains. Eight people were killed in the B-24 crash, and a four-man Army Air Force crew was killed in a C-109 crash. It marks the first time the Defense Department’s POW/MIA Accounting Agency is bringing home remains of missing military members from India. Two bone fragments — small enough to fit inside a sandwich bag — along with some other artifacts from the B-24 flight were found during a U.S. excavation in the rugged mountain. Their discovery and return gives hope to families that the remains of the estimated 350 U.S. service members still classified as missing in India may someday find their way home. According to Gary Stark, the India desk officer for the POW/MIA Accounting Agency, the B-24 — known as Hot As Hell — went missing with its crew of eight in January 1944. The aircraft was one of many that ran supplies from China to India, flying people and parts back and forth over what they called the Hump. The second set of remains was turned over to the POW/MIA agency by a third party and was from the same region. The Pentagon said the remains are “possibly” related to a C-109 that crashed on July 17, 1945, traveling from India to China. After Wednesday’s ceremony at the airport in New Delhi, the remains, which were put in ceremonial boxes and then into flag-draped caskets, will be sent to a lab in Hawaii for DNA testing. Only then will officials know if the fragments belong to one or two crew members. The B-24 crash site is one of many in the mountains where U.S. aircraft went down as they tried to negotiate the harsh and jagged terrain. Teams have tried to excavate sites before, but in 2008-2009 they found no remains. This time, experts aided by mountaineering adventurers identified four areas to search. Two were in terrain that was too dangerous for crews to work in because of possible landslides. High on the steep mountains of Arunachal Predesh, along India’s northeast border, the recovery team climbed more than 9,000 feet. According to Marine Capt. Greg Lynch, the team hiked for three days to set up a base camp, then climbed to the crash site every day, carefully sifting through dirt to find remains. “It was very physically grueling to go to this particular area and to conduct this recovery,” said Lynch, a team leader who was not on this project. He said the team included 12 mainly military members, along with another dozen or so contractors. Along with the bone fragments, the team found other items associated with the crash but no personal effects, such as dog tags or watches, that could identify the crew. 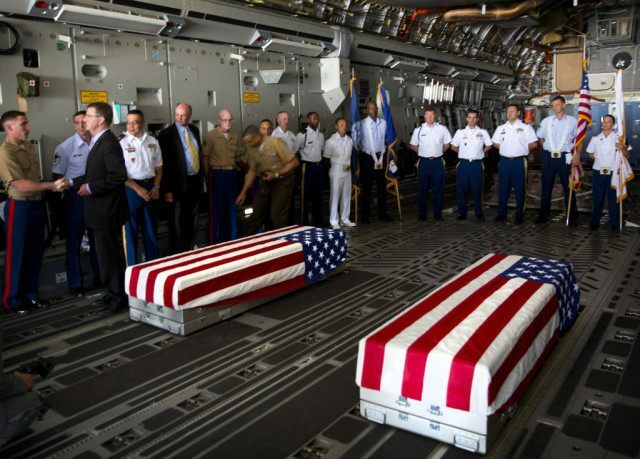 U.S. Defense Secretary Ash Carter, who has been traveling in India, watched as taps was played and the remains were placed in the caskets and loaded onto a C-17 aircraft for the flight home. The Pentagon has restated its commitment to families of the thousands of servicemen still unaccounted for from World War II and the Korean and Vietnam wars. Many of those families have, over the years, complained bitterly of delay and even neglect from the Pentagon agencies charged with finding, recovering and identifying remains from overseas wars. Carter’s predecessor at the Pentagon, Chuck Hagel, ordered the MIA accounting bureaucracy to reorganize and consolidate as part of an effort to improve its performance, which also has come under criticism in Congress. Under increased scrutiny, the POW/MIA office has increased the number of remains that were identified last year, to nearly 100, and expects to exceed that number this year. No more excavations in India are planned for the fiscal year that ends on Sept. 30, and officials said they didn’t know the schedule for next year.